Vincenzo Nibali (Astana) won stage 10 of the Tour de France in an epic mountain ride to reclaim the overall race lead as rival Alberto Contador (Tinkoff-Saxo) was forced to abandon after crashing heavily. 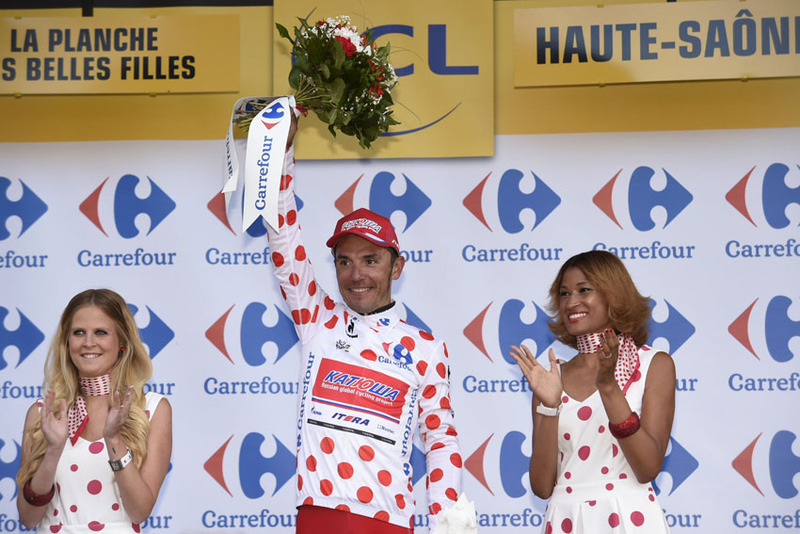 It might have been Bastille Day but the French ended it with neither stage victor nor yellow jersey. Instead, it was another massive day of shocks on the Tour, which saw yet another pre-race favourite crash out of the race. After Chris Froome on stage five, today it was Contador who crashed, wrecking his knee and his 2014 Tour de France. Contador crashed with 93km to go and, given that it took him four minutes to get back up, it was obviously bad. By the time he had had his right knee bandaged up and got going again, he was five minutes down on the front group. Half an hour’s pedalling and grovelling later, Tinkoff Saxo sports director Philippe Maudit got out of the team car and gave it up to Contador, as the Spaniard abandoned. In spite of the fact that Nicolas Roche and Matteo Tosatto dropped back to try to pace Contador back to somewhere near the front, in spite of the fact that Vincenzo Nibali’s team ‘held station’ at the front of the bunch rather than attacking, in spite of the encouragements from the team car from Bjarne Riis, Contador climbed off, his 2014 Tour de France at an end. The stage – earmarked by many as one of the two or three toughest of the race, harder than any of the bona fide Alpine stages according to some managers – was short and peppered with steep climbs which came in rapid succession. With riders tired from a week of racing and the rain still battering the peloton, it was always going to be a massacre, it’s just a pity that one of the victims was Contador. And Contador wasn’t the only GC rider to crash. Tiago Machado, the NetApp-Endura rider who had leapt up to third overall after featuring in yesterday’s break to Mulhouse, also crashed and, although he picked himself up and started riding again, he slipped back, was last on the road and lost over 43 minutes. Truly, it looked like a merely staying upright and making it to the finish was going to guarantee a decent GC finish in Paris. Predictably enough on Bastille Day, the first elements of the break of the day, which formed after eight kilometres, featured no fewer than four Frenchmen, which had to be the bare minimum on Bastille Day. The men who finally made the front (after 26km) were Giovanni Visconti (Movistar), Lieuwe Westra (Astana), Christophe Riblon (AG2R), Amaël Moinard (BMC), Thomas Voeckler (Europcar), Markel Irizar (Trek) and Arnaud Gérard (Bretagne), Joaquim Rodriguez (Katusha), Peter Sagan (Cannondale) and Jan Barta (NetApp). Even if none of them were to actually get on the podium – and even if Rodriguez outsprinted Voeckler for all but one of the mountain points ‘primes’ – the French had held their end up. On the second climb of the day, Tony Martin and Michael Kwiatkowski of Omega Pharma chipped off the front of the soggy peloton and eventually made their way to the front group, which added a little spice to affairs and added a lot of horsepower as yesterday’s stage winner Martin applied himself at the front, dragging his young Polish team mate into the virtual yellow jersey. It didn’t last. Once Astana had learned that Contador wasn’t coming back, they started to ride with more intent, aided by Lotto, defending the yellow jersey of Gallopin, though the Frenchman looked to be struggling. The Kwiatkowski group had a lead of over four and a half minutes (OK, 4-35), but that was as much as they were given and the GC and stage prizes started in earnest with 30km and two tough climbs still to go. Sure enough, the race peeled itself apart, with bodies falling out the front and the back groups. Rodriguez said at the pre-race team presentation that he fancied the mountains jersey and a stage and today he went for it. It’s not quite third overall on the podium in Paris, but it’s not bad by way of a comeback, but when he dropped Kwiatkowski and headed up the Belles Filles on his own, it was touch and go, as the Astana led ‘peloton’ exploded. With just over 2km to go, Scarponi looked over to Nibali and said ‘Vai!’ which his team leader did to devastating effect. He caught Rodriguez and, although the Spaniard held on to the Italian champion’s wheel, when Nibali accelerated again, determined to put time between himself and Richie Porte (Sky), Romain Bardet (AG2R), Tejay van Garderen (BMC) and those other pretenders to the podium, he was gone for good. If Nibali had looked like a Tour winner in waiting after his exploit on the cobbles of Northern France, now, with Froome out and Contador gone, this stage win made it abundantly clear that the Tour is his and his team’s to lose. The battle now is surely for second and third places in Paris.